It's definitely sports-season on TV and everywhere you look. Whether it's football, or basketball, or soccer, or baseball, you can probably find some kind of game playing on a TV channel at any time of day. With sports comes tons of loyal fans gathering together to watch their beloved teams go for the victory. There will be tons of tailgating, group gatherings at bars/restaurants, and home reunions with matching team jerseys to boot. Usually, if you're not playing host or hostess, it falls on everyone that teams up (sports pun ja!) to bring a plate for the watch party, and finger food or quickly-made recipes are most definitely the go-to's. One food that's super beyond common are chips and dip as well as nachos, either with cheese dip or salsa dip that's usually poured straight out of the jar or can that it comes in. What if there was a way to reinvent the wheel? What if reinventing the wheel ends up in stellar nachos that are a far cry from the typical gas station ones we all have eaten at one point or another? Then, boy, you're in luck tonight. I can't even tell you how many times I've had to remake this recipe and share it out with friends and family. 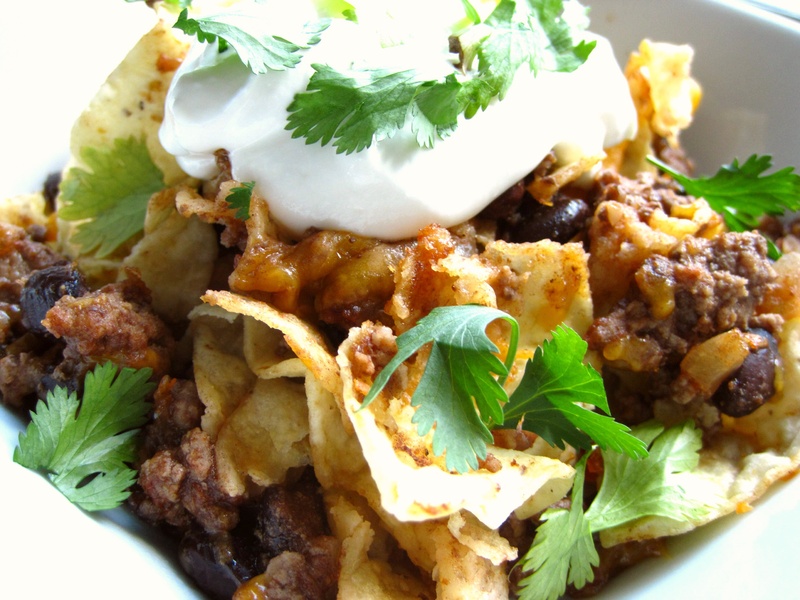 These nachos are sure to be a giant hit anywhere you decide to make and take them to. The flavors melt together in the oven and end up in these nachos being an addictive part of any great potluck. A plus-side to this recipe is that it can be adapted to meet vegetarian dietary restrictions by omitting the beef, which you'll see below at the end of the main recipe, and the beef-omission won't compromise the amazing flavors that star in this snack. "For an eye-catching plate of nachos, use colorful tortilla chips." 1) Spread half of the tortilla chips on a 9x13" ovenproof platter; set aside. 2) In a large skillet cook beef over medium heat until brown. Drain off fat. Add beans and the 1 cup salsa to beef. Spoon half of the beef mixture over chips. Sprinkle with half of the cheese. 3) Bake in a 350F oven about 10 minutes or until cheese melts. Remove from oven. 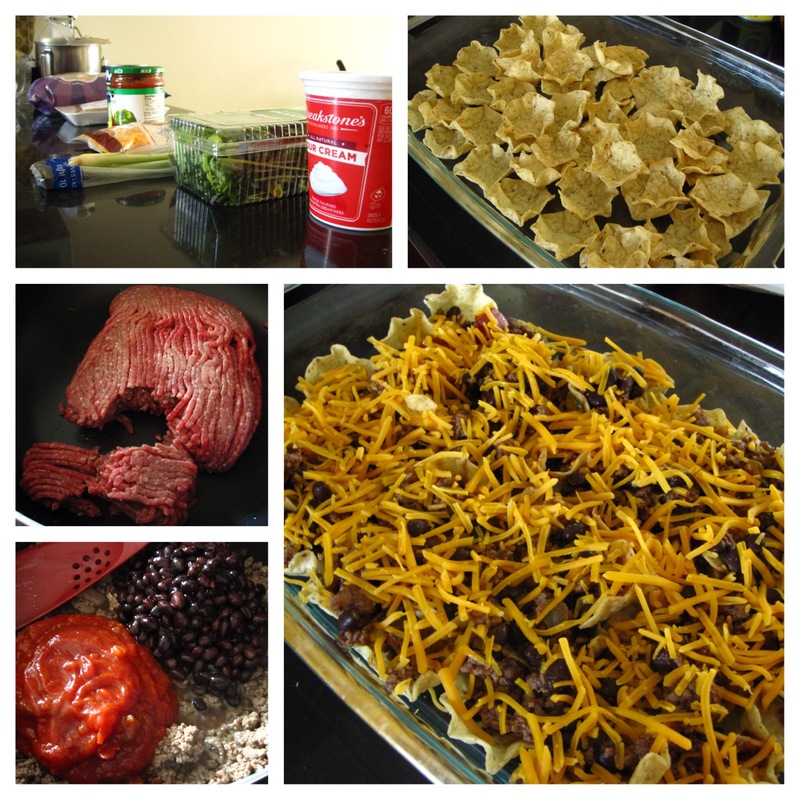 Top with remaining chips, beef mixture, and cheese. Bake about 10 minutes more or until cheese melts. Top with cilantro and sour cream.